The second round of the NAB AFL Women's Under-18 Championship moved to Broadbeach on the Gold Coast on Wednesday. All six teams played, with the Allies – a composite team made up of girls from South Australia, Northern Territory and Tasmania – producing the best effort of the day to defeat the in-form Western Australia. The Allies, led by Adelaide's AFLW coach Bec Goddard, overran Western Australia by five points. They kept the girls from the west to just three points after quarter-time. It was the Allies' second win for the week, after they overcame NSW/ACT on Monday. The two victories are even more remarkable considering the players came together only last Friday, while some state teams have been training for months. It was a disappointing result for Western Australia, which had looked like one of the strongest teams in the competition after Monday's dominant win over Vic Metro. Allies: Ruck Jess Allan is about 182cm and has a decent vertical leap. The South Australian gave her teammates first use of the ball for most of the day. 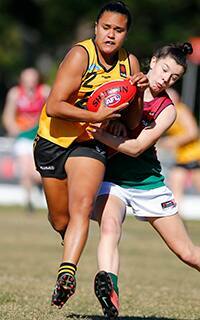 Western Australia: McKenzie Dowrick was strong in the air and has great hands. The midfielder has to wait another year before she is eligible to be drafted, but is a name to watch for the future. The teams have a rest day today, with team bonding activities and recovery sessions planned. Three games will be played on Friday, the final day of the championships, at Broadbeach. Vic Metro will take on NSW/ACT from 10am AEST, Vic Country faces Western Australia at 11.40am AEST, and the Allies play Queensland in the final match at 1.30pm AEST. An All-Australian squad will be released on Friday evening, with the final team to be selected at a later date.